Juggling accountancy, playing as a professional flautist, acting as fixer for orchestras and rock bands and a professorship at Guildhall School of Music and Drama, we were lucky to be able to entice Trevor Ford to come and speak about his “Illicit and Devious Business” at Music Matters. We discovered that your basic job as a fixer is hiring and firing. The majority of musicians in this country are free-lance and, as music is a “No Vacancies” profession, every concert has to have exactly the right number of people. And you just have to trust that the right musicians turn up at the right place ready to play the right music in the right clothes! The fixer then also has to run the whole of the rest of the event from sorting out the stage, lights, seating, piano moving and often feeding hungry people in limited time. Trevor linked music to his talk with Sibelius’ “The Swan of Tuonela” demonstrating just like swans, fixers are calm on top, whilst paddling like mad underneath! Mendelssohn’s Wedding March showed the similarity between concerts and weddings – years of preparation with lots of working behind the scenes, and then just like that, its all over in an hour or so! Trevor’s last anecdote with Holst’s Jupiter showed what could have been a fixer’s nightmare; the first performance of The Planet Suite in 1918 was performed in the Queen’s Hall with Holst’s friend Adrian Boult conducting after only a two hour rehearsal-not bad! Mother and son, Julia Desbruslais and Tim Posner, gave an intimate family concert and talk exploring the history of music for two ‘cellos. We started with Gabrielli, who composed a canon in the 1500s which was the first piece of music written for two cellos. The players play the same piece of music but one starts a bar after the other, and it is still musical! Then, Boccherini, in the 1700s, was one of the first people to use the left thumb position on the fingerboard thus increasing the range and versatility of the cello. Knowing this fact it was fascinating to listen and watch it being demonstrated with a lovely sonata. We were then introduced to Mozart’s Table Music. 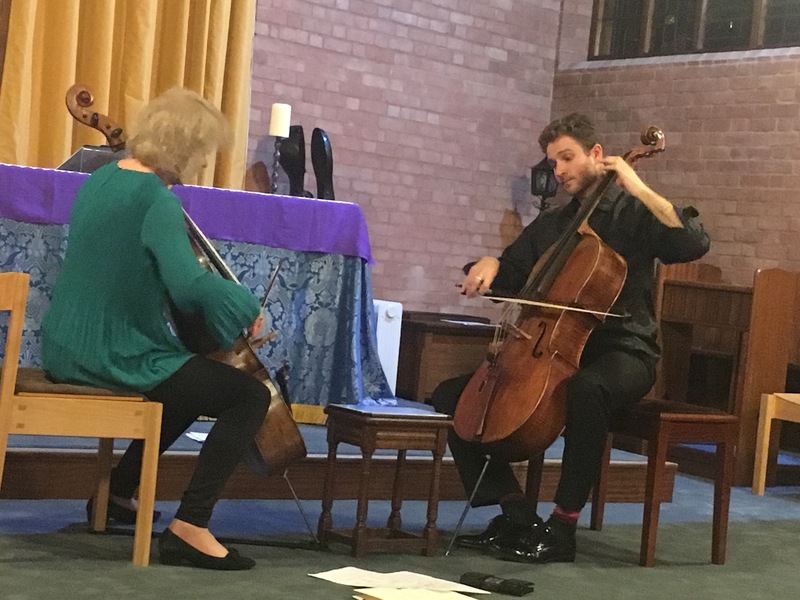 One piece of music, two cellists on opposite sides of a coffee table – what a thing to dream up! We shot forward to modern times with a boogie and blues number from Aaron Minsky, a rock guitarist turned professional cellist who has written copiously to inspire young cellists and really showed the versatility of the instrument. Our evening ended with a beautiful sonata by Romburg from 1767. Beethoven had great respect for the young composer and offered to write a piece for him but Romburg told him he preferred his own compositions-the precociousness of youth! It was a truly magical evening. Julia Desbruslais and Tim Posner playing Mozart’s Table Music. We’d like to thank all the Friends of Everyone Matters and everyone who comes to Music Matters, as your donations and tickets help keep Music Matters going and what a wonderful and varied season we have had so a huge well done to Margaret for organising it all. These concerts were given by Julia Desbruslais and Tim Posner, both on the ‘cello. Julia has been working as the co-principal cello at the LMP for the past 25 years, and has recently become its Executive Director. She has a particular passion for inspiring and educating children, which has led to the production of TV workshops and compositional projects. Tim Posner, Julia’s son, is a student of Leonid Gorokhov at the Hochschule für Musik in Hannover. He has won many awards, most recently being the Gundlach Musikpreis for his artistic excellence. They performed a varied programme at four venues. This included the Jack and Jill Club in Croydon which is a club that provides musical entertainment and biscuits for the retired. They always love a good dance there, so the programme included some dance music for them to enjoy – and of course they danced to it! We have been asked to come again next year, so Julia and Tim were obviously a hit! Later that day, they also performed at Orford House, a beautiful care home n Sutton. Julia and Tim were out the following day too. They gave concerts at St Cecilia’s Leonard Cheshire Home in Bromley. This is a home that provides care to severely disabled adults. They look after adults of all ages and whenever we visit there, we always have such heartwarming encounters. The final concert was at Bethlem Royal Hospital Chelsham House. 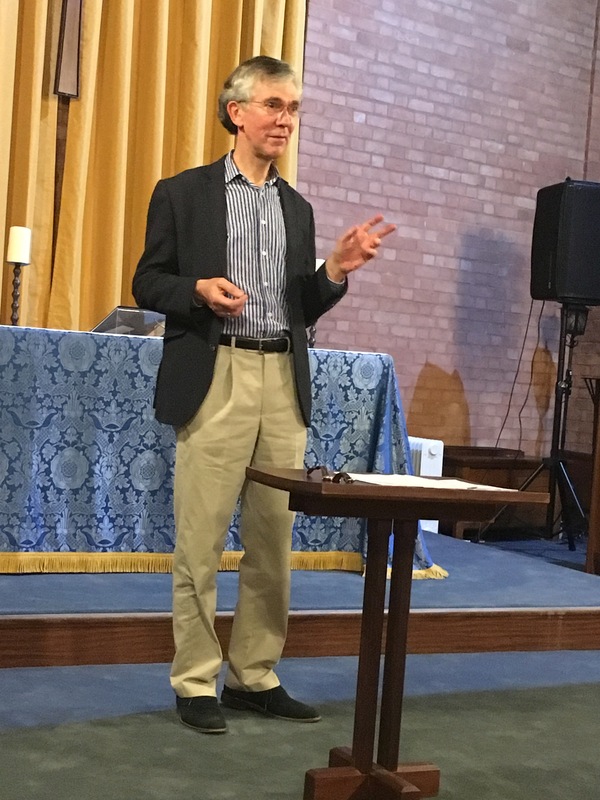 This series of concerts was supported by donations from the homes which we are very grateful for, and the Friends of Everyone Matters, which give us voluntary contributions to carry out our work. This was a set of concerts given in two homes in Hitchin; Highbury Rise Residential Home which caters mainly for sufferers of dementia, and Elmside Methodist Home. Margaret was joined by Sarah Butcher on the ‘cello for these two concerts. Sarah Butcher is passionate about chamber music, and was the Artistic Director of the Chamber Players for 10 years. She has played in many orchestras and ensembles, including the London Mozart Players and Glyndebourne Touring Opera Orchestra. At Elmisde, the concert was given in the style of Musical Menus. Margaret prepares a ‘menu’ of different pieces the musicians can play organised in the style of music, such as ‘TV themes’ or ‘A trip to France.’ The audience members can then choose what pieces they want to hear. This is often old classics that they know well, or new pieces they haven’t heard that sound interesting. It’s a great way to interact with the audience and makes it more fun for them! To celebrate Mother’s Day, Margaret was joined by Jonathan Duke on visits to Burrell Mead care home in West Wickham and Greenhill (Missioncare) nursing home in Bromley. Margaret and all the musicians have had a very busy month, and aren’t slowing down in April either, with lots of exciting projects planned. We’d like to thank all our funders and everyone that comes to Music Matters. You allow us to keep putting on concerts and running projects, taking music to the people who need it most. Alice Britton is a former pupil of Margaret’s and has worked with Everyone Matters as a young musician for a few years, helping organise and give concerts with other young musicians in special needs schools and care homes. After learning about all the amazing work Margaret and Everyone Matters does, she wanted to help spread the word and so is now the Social Media Manager for the charity, running the Twitter and Facebook pages, and doing the monthly blog.